READ Poncha's story below ! As you see Poncha has some famous dogs in the lines , but there's also Malinois blood , in the 15th generation we find famous Tjop and Cora .Poncha has always been a very good working dog. Even now , at nearly 10 years , she would give her live for her ball. Poncha is not only beautiful ( look at show results and pictures )she has always been a dog with a splendid character , she is extremely sociable , is wonderful with kids and cats , she's a very good guarddog , she is very talented for work , this in different fields . 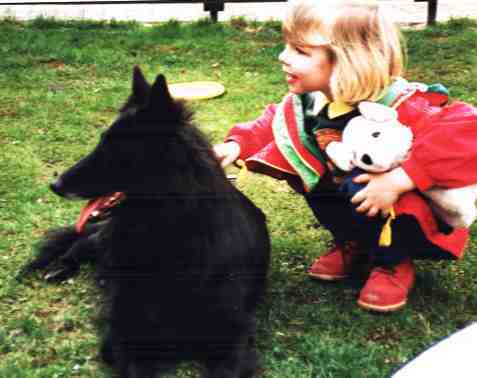 From a very young age on Luc started training her for the tracking , she did great and learned very quickly. 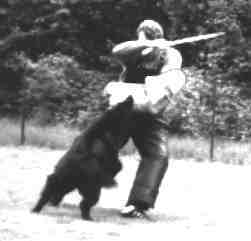 He started training her in a club to learn the obedience and the manwork of the IPO program ( Internationale Prüfungs Ordnung )( almost like SHUTZ ), also called RCI ( Règlement de Concours International ) or IWR ( Internationaal Wedstrijd Reglement ) Poncha and Luc trained 6 days out of 7 . 1993 was again a succesful year for Poncha . 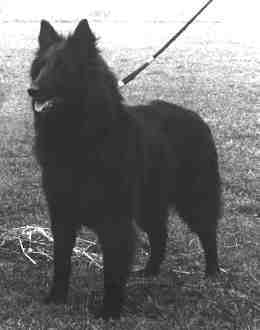 In October she won the last CAC she needed to become Champion of Belgium , a title that can only be gained when the dog ( Belgian Shepherd ! ) has won the necessary CAC or CACIB and when he or she passed the IPO , RING or CQN exam . The same month we took Poncha to Holland and there she succeeded in the UV exam ( UithoudingsVermogen test , we don't have this in Belgium )This is an endurance exam , the dog has to run next to the bike , on all kinds of surfaces , for 20 kilometers ( about 13 miles ), the judge constantly checks the dog to see if it isn't crippled ( look for defaults in the elbows ), during the short break ( after 8 km and after 15 km ) the footsoles are checked , they may not bleed or be worn out. 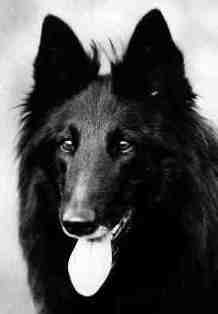 At the end the dog still has to pass some obedience tests. 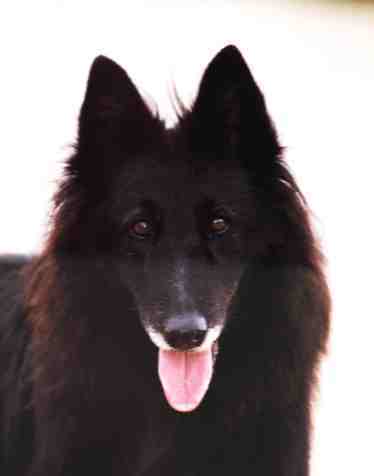 Poncha's last show was in June 1995 , at the World Dog Show in Brussels , where she won the CAC ( in working class ) and thus became Belgian Winner 1995 . From time to time we still take Poncha to the club to let her do the manwork , because she loves to do this. 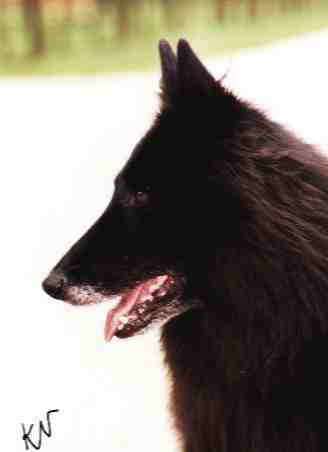 October 1996 : Poncha was tested on her herding instinct by Steven Szabo. He came all the way from California , USA , to choose 2 puppies from her litter with Gylson. As the puppies would be used for herding , he would like to test Poncha , so he did , we took her to a friend who has 6 sheep , Steven took her with him into the meadow and she immediately understood the signs he used , she loved doing this , and after a few minutes all the sheep were in the stable. If this was tested in the USA , Poncha succeeded succefully !